Snail Eating Competition - Ciogghitta d'oro ~ Sardinia Baby! If it's eating snails that you like then no place is better than Sassari in the North West of Sardinia. Every August teams of two people compete to see how many snails they can consume in the shortest amount of time. "Succiadura di ciogga minudda" or sucking the small snails as it's known in Sassaresse is an art form and nobody seems to be better "suckers" of the intrepid snails than Capeccia Antonio and Antonio Pintus from team "Arcade Las Vegas" winners for the second consecutive year. These two young men consumed a record 115 snails in just two minutes. It's not just a matter of speed, but technique - head down, right hand full of snails, left goes to the mouth and so on. 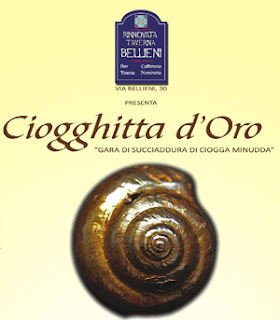 Cheered on by a huge crowd of people who have invaded via Bellieni they empty the first bowl and fill the second as they work in well practiced tandem to win the coveted 'Ciogghetta d'oro' - The Golden Snail. Strong competition comes from team 'Ti si magnani li cani' who take the silver snail closely followed by the aggressive "Cioggana di Dozzi," who take the bronze. In fourth place are the "Caracoles" who win a dinner at the restaurant "La Guardiola' in Castelsardo. The fifth ranked team get a ten-pound bag of 'ciogga minudda'. This is a unique, fun event that we would recommend to anyone passing through this part of the Island in August.